Heat gas or charcoal grill. In large skillet, place steamer basket in 1/2 inch water (water should not touch bottom of basket). Place asparagus in steamer basket. Cover tightly and heat to boiling; reduce heat to low. Steam 6 to 8 minutes or until crisp-tender. Meanwhile, in medium bowl, gently toss tomatoes, cheese, olives and 1 tablespoon of the basil. Cover; refrigerate until serving time. In small bowl, mix remaining basil, the oil, garlic salt and pepper. Brush mixture over tuna. Carefully brush oil on grill rack. Place tuna on grill over medium-high heat. Cook uncovered 5 minutes. Turn carefully; brush with any remaining oil mixture. Cook 10 to 15 minutes longer until fish flakes easily with fork and is slightly pink in center. 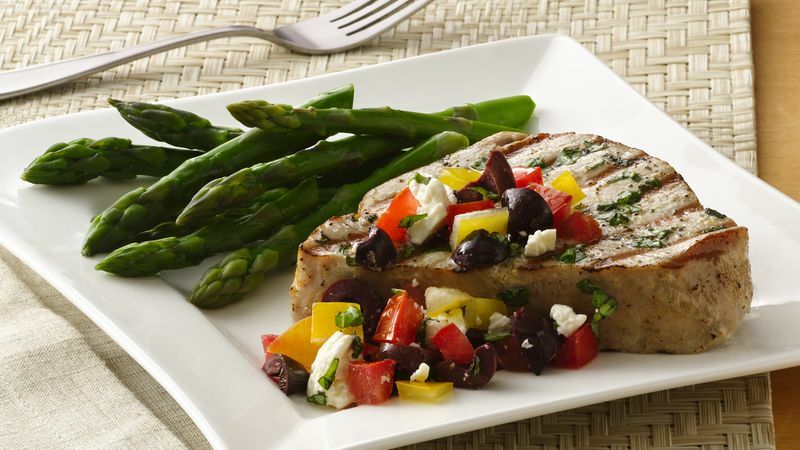 Serve tuna with tomato mixture and asparagus. For a colorful presentation, use a mix of red and yellow tomatoes with the feta and olives. Kalamata olives are Greek olives with a dark eggplant color and rich fruity flavor. They come packed in olive oil or vinegar.